WPI team builds smartphone app that detects alcohol intoxication level from a person’s altered gait. After a few drinks, it can be dangerously easy to convince yourself that you’re sober enough to drive. To help people make better choices, a first-of-its-kind smartphone application now in development at Worcester Polytechnic Institute (WPI) will tell users when they’ve imbibed too much by monitoring changes in the way they walk. 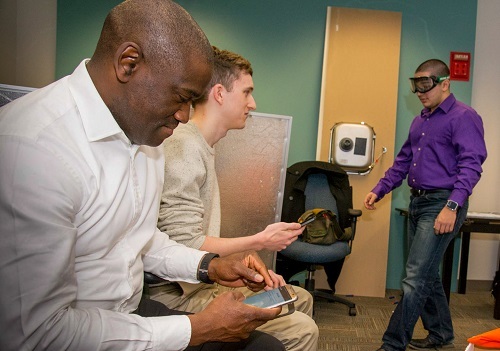 Dubbed “AlcoGait,” the app was conceived by Emmanuel Agu, PhD, associate professor of computer science. The current version predicts a person’s blood alcohol content with 90-percent accuracy, on average. AlcoGait runs in the background on the user’s smartphone, continuously analyzing their walking pattern, or “gait,” for anomalies. Users can track their intoxication level to decide when to stop drinking, and the app will send a text message and make the phone buzz when the user’s gait indicates he or she has likely exceeded the legal limit. According to the National Highway Traffic and Safety Administration 9,967 people died in alcohol-related car crashes on U.S. roads in 2014 (the most recent year for which data is available). A long-term review by the U.S. Centers for Disease Control and Prevention found that 119,100 people were killed in such accidents between 2003 and 2012. Agu’s research focuses on mobile sensing and computing, digital graphics, and the development of smartphone applications that improve healthcare. As smartphones became equipped with accelerometers and gyroscopes to measure motion, Agu saw an opportunity to adapt the “walk-the-line” field sobriety test police use when evaluating a suspected drunk driver. model the user’s unimpaired gait. Then, when going out to a club or party and planning to have a few drinks, the user turns on the app to run in the background. The app doesn’t affect other functions of the phone, but continuously analyzes the person’s movements to gauge impairment. When commercialized, the Agu said the app could integrate with an auto ignition kill switch, or be linked to a ride service like Uber or Lyft so as to automatically offer the user a ride home after their walking patterns indicate they shouldn’t drive. “We look forward to working with external partners to commercialize this app and make it broadly available to the public,” Agu said. Development of the app began in 2014 as an undergraduate Major Qualifying Project (MQP) by WPI students working under Agu’s direction. Then-seniors Zachary Arnold and Danielle LaRose built the first working prototype using data from a smartphone’s accelerometer; their project won the 2015 WPI Provost’s Award as the top Computer Science MQP. The following year, Christina Aiello, a graduate student in Agu’s lab, picked up the project and further refined its algorithms, incorporating data from the phone’s gyroscope. Aiello tested the app on 50 WPI volunteers who donned specialized “Drunk Buster” goggles to simulate varying degrees of intoxication. Aiello’s work was recognized with a first-place award in WPI’s 2016 Graduate Research Innovation Exchange competition. This year, the MQP team of computer science seniors Benjamin Bianchi, Andrew McAfee, and Jacob Watson are working to adapt AlcoGait for use on a smartwatch. All WPI undergraduates must complete an MQP, a professional-level team research project focused on a specific problem or challenge, before graduating. In 2017 Agu and research colleagues Michael Stein, MD, chair of health law, policy & management at Boston University’s School of Public Health, and Ana Abrantes, PhD, associate professor of psychiatry and human behavior at Brown University and associate director of behavioral medicine and addictions research at Butler Hospital in Providence, are planning a clinical controlled study to further improve AlcoGait. They will recruit 250 adult volunteers, who will consume alcohol in a protected environment then have their blood alcohol content tested using both AlcoGait and a breathalyzer to compare results. Data from the study will be used to improve AlcoGait’s artificial intelligence motion detection algorithms. AlcoGait is one of several smartphone-based healthcare applications Agu and his team are developing, including several weight-loss projects, an app to help people with alcohol dependence, and an app to support people trying to kick heroin with the transitional medication buprenorphine. Agu, who serves on the faculty steering committee for the Healthcare Delivery Institute at WPI, was also part of the team that developed the “Sugar” app for people with type 2 diabetes.